Spanish explorers of the 1600's knew they would need to bring herb seeds with them to plant in the new world if they wanted to feel truly at home. This is how Sweet Fennel became distributed along El Camino Real or The Kings Highway which connects the 21 missions that span from San Diego to San Francisco, California. Today, tall wispy spires of green Sweet Fennel can still be seen along Interstate 101 which traces that legendary route. In fact, the plant has became so abundant that today many consider it a native Californian plant; some consider it a weed. With the same sweet licorice flavor as Sweet Fennel, Bronze Fennel (pictured at top) can be used in place of Green Fennel in any recipe, and the soft wispy leaves with their unique bronze color add a lot of visual interest in the flower or herb garden. With a height of four feet and a breadth almost as great, its wide spreading grace also makes it the perfect back of the border plant for cottage gardens. By the end of the summer it will put up tall spikes that will be endowed with little yellow button flowers. If left on the plant, these will turn brown and make fennel seeds. If these spikes are cut back to the ground the plant will stay looking better longer. The leaves are great with fish and can be used to stuff the cavity of a whole fish or to wrap fillets. Jim Long, herbal chef and cookbook author, makes this tasty fennel stuffing for trout. Start by cutting up 1 cup of fennel leaves. Sauté some celery and onion in butter or olive oil until tender, then mix in 2 cups of bread crumbs, 1 cup of chicken broth and the fennel and stuff it into the trout. Then lay slices of lemons over the trout and broil for about 20 minutes. He also makes a tasty quick salad dressing by adding a couple fennel leave into a blender with some oil, vinegar, parsley, and garlic chives. Please visit this page for more information on Jim's herbal cookbooks. Elizabeth Lambert Ortiz in her book The Encyclopedia of Herbs, Spices and Flavorings not only stuffs and bakes her fish with Fennel leaves but also flambe's the fish with an anise flavored liqueur. Also, try combining the leaves of Bronze Fennel with French Tarragon for an extra kick. French Tarragon has a spicy bite that the Fennel does not, and yet both have the anise or licorice flavor. Very tasty Fennel tea can be made from the leaves of both fennels and the seeds of Bronze Fennel. Bronze Fennel is one of the six plants chosen to be in our Zone 5 Tea Herb Garden. Milk steeped with Bronze Fennel can be used to make ice cream or added into baked goods. If you want to collect the seeds (a prize ingredient in Italian sausage), just leave that flowering stalk. You can still harvest the outer leaves, just don't cut the center stalk, which will bear the flowers. Watch as the seeds start to turn from green to brown, and then cut the whole head and allow it to finish the ripening process in a brown paper bag. When the seeds are ripe, they will easily shake loose from the main head. Store in a dry airtight jar out of light. 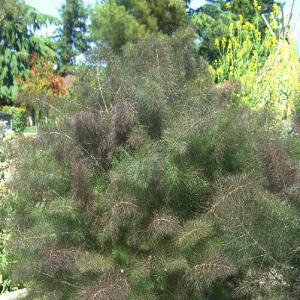 Bronze Fennel is hardy from Zone 5 and is easily grown as an annual in lower zones. Plant as soon as the danger of frost has passed. Full sun and well drained soil are better for producing rich oils and seeds. Cut back to the ground at the end of the season after seeds have formed. Fennel has a long tap root which should not be disturbed after planting. A very important host plant for the Anise Swallowtail and the Eastern Black Swallowtail (pictured at left), Bronze Fennel makes a great addition to our Wildlife Herb Garden Six Pack and is sometimes included in our Butterfly Attractor 36 Pack Assortment. A host plant is one that the butterfly lays eggs on and the baby caterpillars (the larvae) munch on until they get ready to pupate (or spin a cocoon to become a butterfly in). 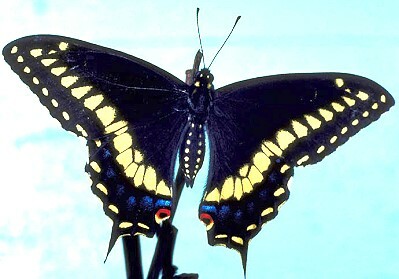 Butterflies also need nectar plants (like Butterfly bushes) that they derive food and water from. Bronze Fennel is included in our Zone 5-11 Tea Herb Garden. This plant is often available in plug trays. These trays hold 128 of all the same plant. They are a great low cost way to fill a lot of space. Each cell is 3/4 of inch by an inch. Check here to see if Bronze Fennel Plug Trays are available.